Tripping Over My Roots: A Passenger List for Mathilda Alfina? A Passenger List for Mathilda Alfina? As mentioned in my recent 2019 Genealogy Goals post, I am on the hunt for the passenger lists for my great-grandmother, Mathilda Alfina Johnson. Based on the ease with which I found my great-grandfather in these lists (actually the list from his passage from Sweden to England found me via an Ancestry hint), I once thought Mathilda's lists would be even easier to find, but so far I've had no luck. Church Register, Emmanuel Lutheran Church, So. Manchester, CT, page 82 - Arrived in America - Sept. 5, 1890 - she was listed here first when she joined, then moved to page 72 when she married my great-grandfather. Mathilda's final wishes transcribed by son Elmer - "Came to America in 1890." The end of the transcription has a note from Elmer, "Mother, her sister Anna and a neighbor Selma Carlin, came together." 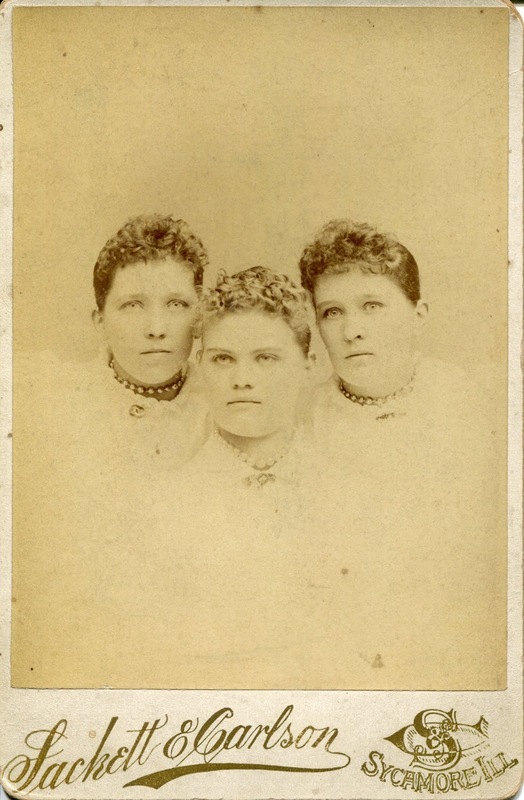 The above photo, taken in Sycamore, IL, their first destination in the U.S., is marked on the back with the names of the three women in my grandmother's handwriting; she knew all three women. The Church Register for Salem Lutheran Church in Sycamore shows that Mathilda, Anna, and Selma joined on the same date in 1891 and all three entries have an arrival date of '90. The page 82 Church Register entry for Emmanuel Lutheran Church, which records Mathilda's joining the congregation, shows that Anna and Selma joined with her and also listed the same arrival date of September 5, 1890. Mathilda did not include any other information in her note about her immigration to the United States but knowing that my great-grandfather came through New York, I looked first for ships arriving on September 5, 1890, in the New York lists on Ancestry. I also searched ten days before and ten days after September 5th. Even with three names to look for and looking through the lists page-by-page, I had no luck. I've been doing this long enough to know that while New York was the busiest port for immigration, it was not the only one, but before going any further, I decided to educate myself a bit more and spent some time watching Lisa Alzo's Legacy Family Tree webinars on Passenger Lists and, because you can sometimes find arrival information in those records, Naturalization (although Mathilda might have gained her citizenship automatically through Carl depending on when he became naturalized). Now I am reading two of the books Lisa suggested in the Passenger List webinars, They Came in Ships by John Phillip Colletta and American passage: the history of Ellis Island by Vincent J. Connato. Thank goodness for libraries! Lisa's webinar series on passenger lists is excellent and so is the book by John Colletta which I am well into at this point and already know I'll need to purchase for myself. I feel that if those passenger lists still exist, I will find them. And, of course, I'll keep you posted. Best of luck finding Mathilda! Merry Christmas and happy new year.